If you're one of the few people who still haven't bought your Christmas tree yet, then you're either panicking by now or just can't decide between getting a real one or a fake one. There are of course advantages and disadvantages to both. You can't beat the real thing with the non-drop Nordman Fir tree which are very popular and make Christmas a traditional affair, yet many may not like them for ethical or practical reasons (those needles get everywhere, don't they?!). So the usual plastic replica option seem to be the only way forward, and even though high-end fake Christmas trees are almost indistinguishable from the real thing now like this Vermont White Spruce tree from Balsam Hill, we can't help feeling there must be other creative alternatives that show off and match your love of design and interiors. That's why we've done some research and come up with our very own top five alternative Christmas trees you can buy or perhaps even make yourself! For those with a gadget and electronic obsession, this tree made from spinning LED lights is the perfect way to dazzle and delight children and adults of all ages. See how they created this clever light display over at Zedomax. 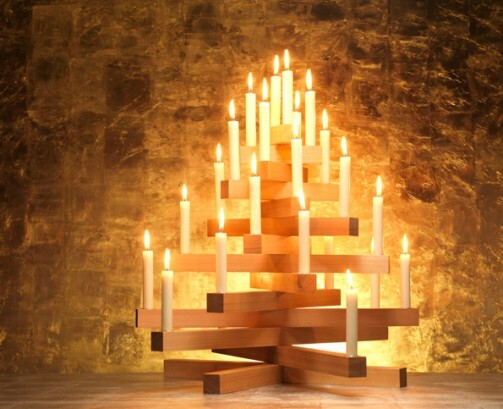 This Northern Pine Wood Tree by Sandra Lindner has a certain Germanic feel to it with the clean wood with candles perched on each tip. Perfect for your doorway, hallway or entrance to your home. For all those music lovers out there, why not create this feathery tree made from musical manuscript. Even if you aren't connected to music, we think this simple almost origami-like version is rather genius and brings a bit of class to any room. Bit like Mozart was, really. Marian Parsons shows how to make them here. Love the Beano, Superman or The X-Men? Channel your inner geek and get this amazing comic strip inspired laminated wooden tree! This tree has a cheeky, fun feel to it and brings a bit of nostalgia to the home and perfect for the modern bachelor pad. Available to buy at Bombus. Not a fan of tinsel and cheesy fairy light? For those who love a clean, minimal home, stylist Sarah Ellison has the perfect antidote to the usual Christmas chintz with this elegant tree and white and pink geometric decorations. You can follow her on Instagram here. Finally, we had to include these two extra ideas for those who may want to create a last minute tree without having to spend a lot of money and using items around the house. We love this mirror tree made from green objects and a full length mirror and the book case Christmas Tree is just genius! Get more tips and ideas for your space by following Space Shack on Instagram or liking us on Facebook.